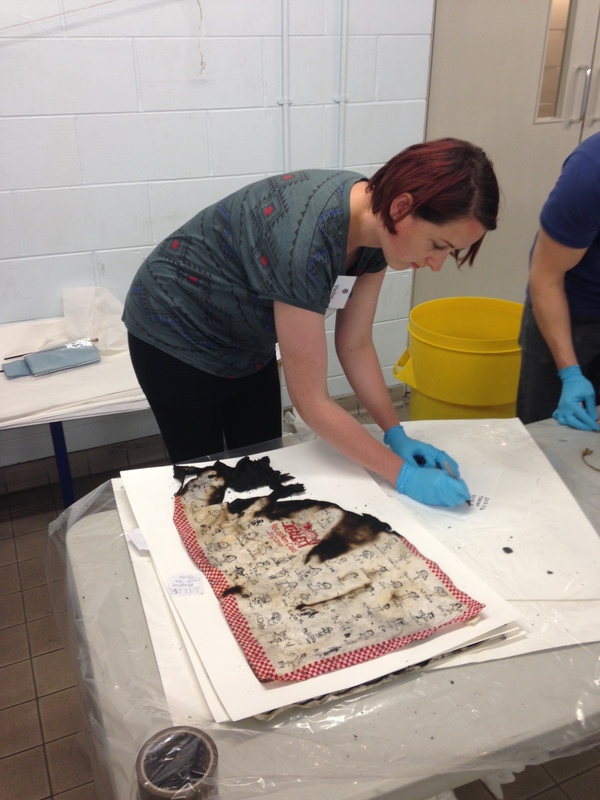 For the past two days, myself and our Regional Conservator, Karen, have been at the Tyne & Wear Fire and Rescue Service Headquarters, delivering salvage training as part of the Conservation Advisory Network (CAN). Ten delegates took part on each day, from the following museums across the region: Preston Park Museum, Berwick Museum & Art Gallery, Seven Stories, Woodhorn Museum, Durham University Museums (Oriental and Castle), Durham Light Infantry Museum, Head of Steam Museum, and the Baltic. 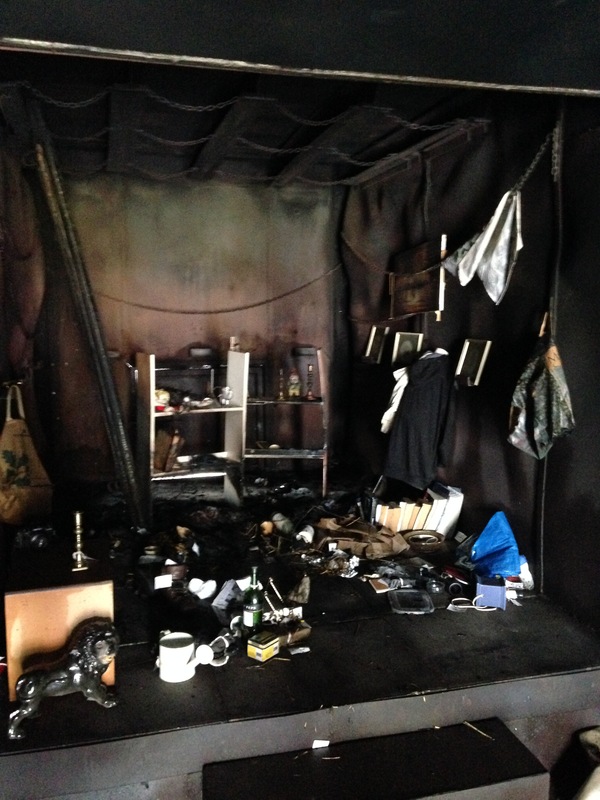 As the recent fire at Clandon Park shows, a fire in a museum or historic house can happen without warning. As such, it is crucial that museum’s have an emergency plan , and that the staff know how to respond if called to do so. We set up a small branch of The Bowes Museum in a shipping container*, with ‘museum objects’ including glass, ceramics, stone, paintings, books, photographs, textiles and documentation both on display on shelves, and hanging from the walls; and in storage boxes. 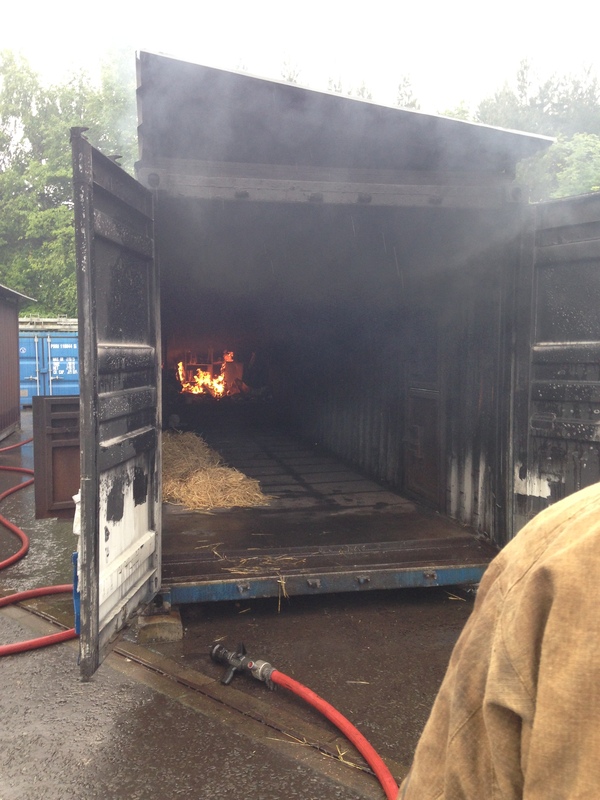 On day one, to avoid causing too much damage to our collection, a hay bale was set alight within the container, allowing the contents to be thoroughly smoked, before everything was dowsed with water. On day two, to add to the excitement, the entire ‘museum’ was set alight, allowed to burn, then the flames extinguished with a hose (all by a trained firefighter). 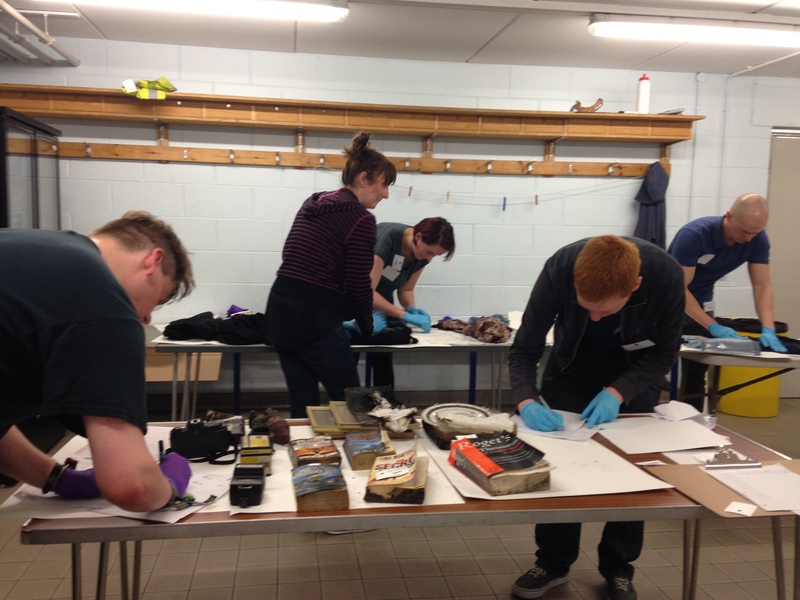 The course attendees were given the disaster plan for the ‘museum’, a list of all the accessioned objects (to add to the confusion, and make it more realistic, some of our objects had accession numbers, but some did not), and the disaster kit. The kit included blotting paper, polythene sheeting, electric fans, labelling materials, plastic crates and personal protective equipment. The groups then had to organise themselves, appoint a team leader, work out their strengths and delegate tasks. 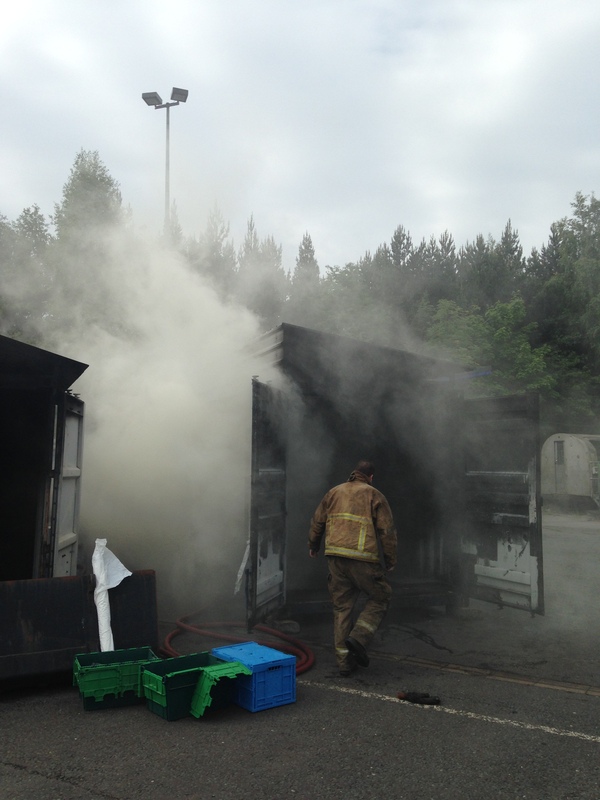 In a real fire salvage situation the first 48 hours are crucial to remove vulnerable organic materials, which may develop mould if left untreated. The teams had 4 hours to clear the container, and either wrap the contents for freezing to be dealt with later, or dry and pack them into crates. 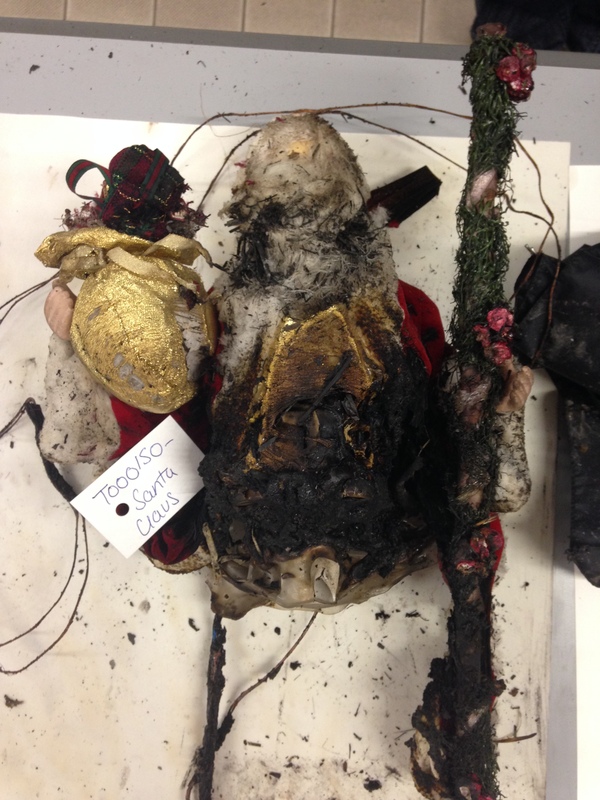 Documentation was crucial, to track the location of the objects, and determine what had survived the fire. Karen and I observed the teams, ensuring no-one put themselves at any risk, and, after leaving them to cope for an hour or two, we stepped in to give advice or help if they asked for it. 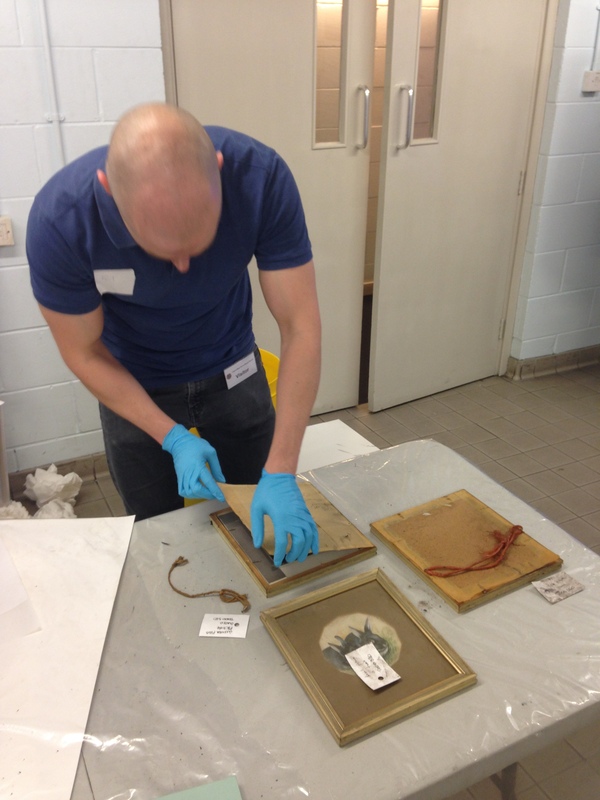 The teams benefited from having several trained conservators, including our Icon/HLF interns. At the end of the day, we gave our feedback. On the whole, the teams did very well. 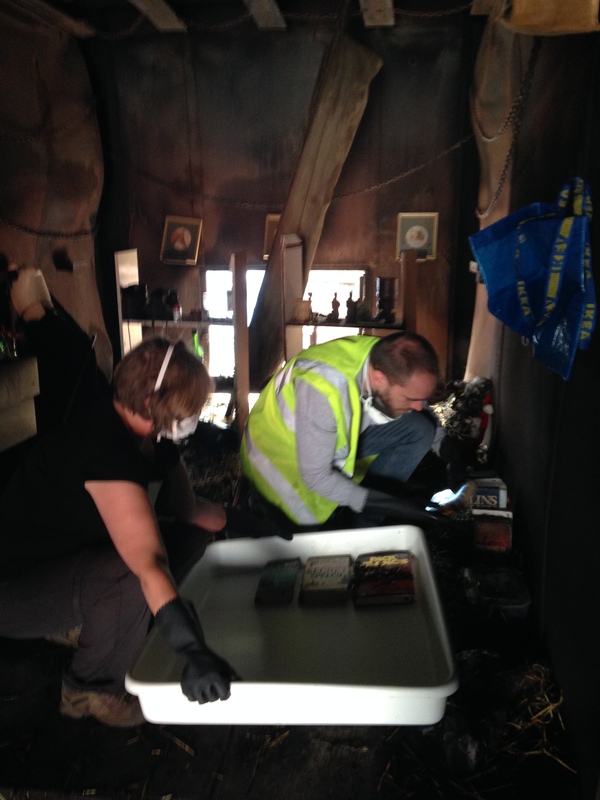 After the first day, 100% of the collection was salvaged, after the fire on the second day, only 80% was retrieved. Reblogged this on Is it time for.